﻿ Miguel Angel Moya - Limited Edition Prints - Collect Them All! NU-MASTERS : A 21ST CENTURY - GLOBAL BASED CREATIVE ART MARKET. LIMITED EDITION, TIME SENSITIVE, SIGNED & NUMBERED PRINTS SERIES. We are happy to announce a limited edition of 25 (5x) prints of the artist’s most iconic and respected works. After 6 months of close collaborative efforts between NUMA Gallery, Miguel Angel Moya and Coriander Studio print house, an exceptional, exclusive limited edition series is now available for pre-order. 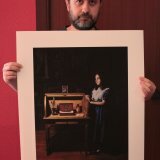 Miguel Angel Moya has created 5 brand new limited edition prints, never before released. The print is of the highest standards and beautifully translates the depth and fine details of Moya’s paintings to Hahnemuhle Photo Rag. The prints are available in 25 copies only, on Hahnemuhle Photo Rag with accented Satin 310gsm Paper and each print is individually signed and numbered by Miguel Angel Moya. 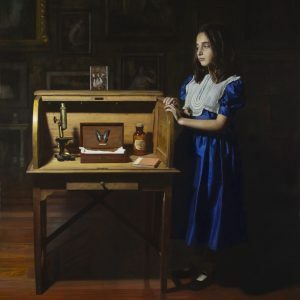 Using the highest quality archival pigments, these fine art prints are fastidious replicas of his signature figurative and still life motifs. The prints successfully capture the delicate gradient effect achieved through the artist’s usage of peculiar mediums and the image renders the essence of his vibrant concepts. Matching our curatorial efforts to deliver high-end paintings by artists that are pushing the boundaries of art, the special purpose team created a very limited edition, balancing between art and high end product design. Meticulously produced in close collaboration with Coriander Studio, the editions keep the quality level and vital attributes of the original artwork. These exclusive new art editions by Miguel Angel Moya are faithful to artist’s renowned high standards in print technique and quality. Produced by Coriander Studio print house. Giclee pigment original print on Hahnemuhle Photo Rag with accented Satin 310gsm Paper. Edition of 25 (5x). Created using fully archival inkjet technology. Shipped according to the highest practices in 6 weeks. Miguel Angel Moya was born in Valencia, Spain in 1970 and began his Fine Arts degree at the Facultad Politécnica de Valencia in the late 1980s. However, he departed from the program two years later disappointed by the method of teaching at the faculty. Around the same time Moya met the realistic painter Francisco Ugeda, and in Ugeda’s workshop, Moya learned the technical fundamentals of painting. In 1992 Moya held his first exhibition in Denia, Spain. 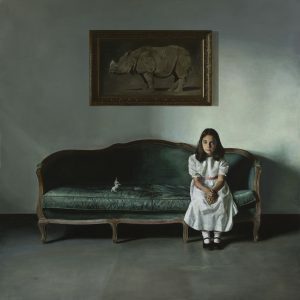 His painting is characterised by a realistic language that does not bow to matter or gesture. In his work we can find influences from the baroque European masters to contemporary artists. After an initial period marked by musical themes, his interests in Jungian psychology and alchemy gave rise to a series of works with a symbolic charge, some obvious and others subtle, as seen in his series of Indoor Scenes. 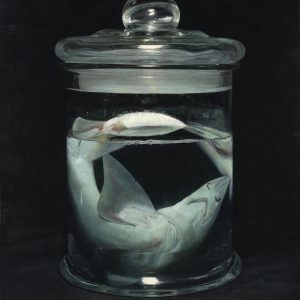 By the end of 2013, his subject matter is focused on still life with biological content, where marine creatures appear in a mysterious atmosphere, sometimes as scientific collections. This current work is a refined expression of the understated macabre. 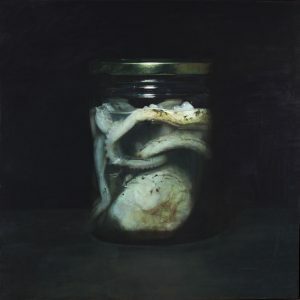 He renders these subjects in glowing detail, foregrounding the surfaces of the organisms and their containers. The compositions of preserved marine life, illuminated in the dark, depicts a microcosm of our planet, its oceans and the human subconscious. In 2014, Line and Stylish Art Magazine chose him as one of the seven most outstanding figurative artists born after 1970 in Spain. Moya has also exhibited his work across much of the world including solo exhibitions in Madrid in 2008, New York in 2011 and Los Angeles in 2017. 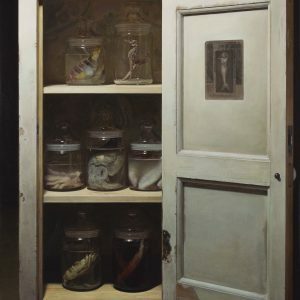 In 2018 his work ‘The Biologist’ exhibited in the National Portrait Gallery in London, UK as part of the BP Portrait Award exhibition. His works have also been displayed in museum collections in Spain (MEAM, Barcelona) and China. JOIN NUMA TO ACCESS TO MORE NEW PRINTS BEFORE THEY ARE RELEASED.